Marriage Anniversary also known as Wedding Anniversary means the date on which the memorable event of marriage takes place. This is the day on which two lives come together to form a family and spread love, care for each other and promises are made to be together until the very end of their lives, no matter how hard how difficult and how much negative situations come in their lives but they will not let the other one alone. There are certain stages of a marriage, For a couple that succeeds 10th anniversary, 25 years of marriage, celebrates their Silver Anniversary on the completion of 25 years & those couples who completes 50 years of marriage celebrates their Golden wedding Anniversary. In this article, you will find a houseful collection of Wishes you can share with your Friends & Family who is celebrating these special moments of their life. By sharing these Marriage Anniversary Wishes you can make them smile and make their day special and memorable. In this article, you will find a houseful collection of 100+ Marriage Anniversary Wishes you can share with your Mom & Dad Anniversary, Husbad or Wife Anniversary or on a Friend Anniversary, who is celebrating these special moments of their life. By sharing these wishes you can make them smile which will be a very precious gift for them and make their special day a memorable one. 2. Best wishes on this special day, may your marriage stay strong and indestructible for many years to come! 3. The special day is back again. The day that you two both took your vows. I am happy to see that you both have the same love you had on your wedding day. A very happy anniversary my friends. 4. The years will pass but I wish that the love between you both only grow more stronger as the time pass by. Happy Anniversary! 5. Wishing you a wonderful and long life together on your anniversary. 6. Great wishes on your anniversary, My Friend, Hope you are happily married till the world ends!!! Happy wedding anniversary!!! 7. Real relationships are when you don’t have to pretend to be someone else, just to be liked for being someone you’re not. Happy anniversary. 9. 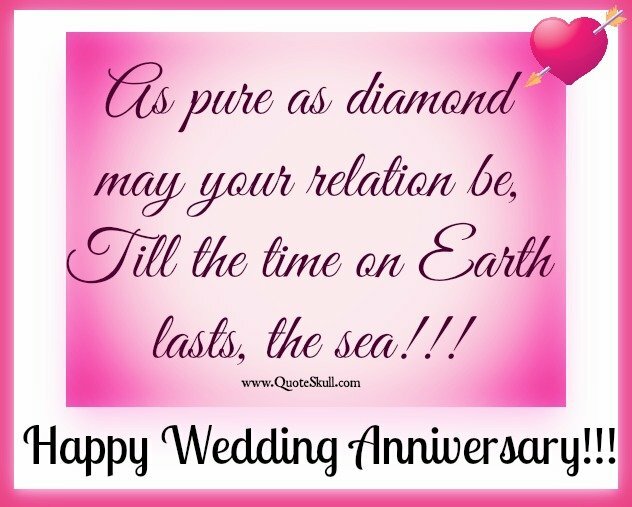 Happy Anniversary and May your marriage be Blessed with love, joy And companionship For all the years of your lives! 10. Roses are red, violets are blue. 11. Happy marriage is based on so many things like love, faithfulness, trust, belief in each other and you are the best example of how to maintain all these things and keep them growing. 12. Love is the truest treasure. Knowing that somebody loves you for so many years despite everything is precious. And I’m very happy that you appreciate it. Congratulations on your wedding anniversary! 13. I am hoping that the love you two shared is as strong as it was years ago because it brought you happiness, joy and much love. This anniversary, i celebrate with you. 14. Happy Anniversary! May your love grow stronger and inspire all, and may life bless you with all the gifts. 15. Wishing you many more years of happiness and unconditional love. 16. As pure as diamond may your relation be, Till the time on Earth lasts, the sea!!! Happy wedding anniversary!!! 17. Looking at divorced couples make me feel that marriages are ephemeral. But you both have proved that marriages are truly eternal. Happy anniversary. 21. You found each other a long time ago. It’s so nice that you manage to stay together by going through all difficulties in your marriage life. Sincere greetings on wedding anniversary! 22. May the love between you lasts a lifetime. As you are the perfect pair I have ever seen. May you live a long loving life. Happy Anniversary. 23. Happy Anniversary! May you get many more years of life together to celebrate with your love getting stronger and stronger with time. 24. Love is meant to be shared. 25. There were many incredible years of your life behind. And there will be a lot of incredible years ahead. I congratulate you on your wedding anniversary and wish you that your family happiness would never run out! 26. Wishing you a good loving life on your first anniversary. You know a determined man like you can achieve a great deal in this life. Always keep your family a top priority. Best wishes for a very happy anniversary. 27. I love to see that you still love each other by heart after this much time. May you get many more happy moments. Happy Anniversary! 29. Falling in love is easy, but staying in love is something different. You did it. Happy Anniversary! 30. It doesn’t matter where we’re at or what we have, as long as I have you by my side, I’ll be happy with that. Here’s to wishing us many more happy years together. 31. May the love between you, bring lots of joy, And may that happiness no one can destroy!!! Happy wedding anniversary!!! 32. Some of the best memories of a couple are not just the magic of their first few kisses but the magic they create every time they kiss for the rest of their lives. Happy anniversary. 34. No one else would understand our relationship, and no one else in this world would understand me the way you do. Happy Anniversary! 35. They said we couldn’t make it. 36. It seems like you never get tired of each other because you’re not only beloved spouses, but also good friends. It’s very important in family relationships. Congratulations on your wedding anniversary! 37. All I ever wanted for you two to be happy since the college. I am very happy to see that the love between you two is still as strong as years back. I wish you a very happy anniversary lovers. I miss you both. 38. Wishing you all the happiness and love in the world and congratulations on your anniversary. 40. Life is very changeable and nobody knows what’s ahead, but I’m pretty sure that as long as you stay together, everything will be fine. Congratulations on your wedding anniversary, my dear friends! 41. Wishing you a very happy anniversary, may you find love, trust, joy and companionship for all years to come in your marriage. 42. Sending you loving wishes that you’ll grow deeper and deeper in love with every passing anniversary. 43. It looks like married life agrees with you, And I wish the best for both of you!!! Thanks for being my friends!! Happy wedding anniversary!! 44. The wrinkles on your faces are not signs of how much you have aged, but how beautifully your marriage has survived the test of time. Happy anniversary. 45. No one in the world would understand you, In the best way you each other do!!!! Happy wedding anniversary!!! 46. Not a long journey, your marriage is an adventure. Not a love story, your marriage is an epic tale of romance. Not a happy ending, your marriage is a blissful loop of sweet memories. Happy wedding anniversary. 47. Happy Wedding to my dear friends. I Hope your life together will be filled with your joy, happiness and lots of love..!! 48. Happy Anniversary and May your marriage be Blessed with love, joy, And companionship For all the years of your lives! 50. No matter what happens in life, your love is still a strong one for each other. Everything looks so easy for you two! Keep it up, warmest regards on this special day. 51. Marriage is that relation between man and wife in which the independence is equal, the dependence mutual and the obligation reciprocal. Happy Anniversary Friend. 52. You’re my everything, today and always. Wishing you a very happy anniversary. 53. Wishing more laughter, more joy, more love for the both of you in the years to come. 54. You guys are the most beautiful couple I have known, Whose love is seen and need not be shown!!! Happy wedding anniversary!! 55. No one and nothing in this world are perfect, but the two of you are as close as it gets. Happy anniversary. 56. May this lovely day, remind you of the love that made us believe in love. May God pour all the warmth on your sweet love. Happy Anniversary. 58. While living together you begin to understand what does it mean to go through all ups and downs in life and stay united. Best wishes on your wedding anniversary for the nicest couple that I know. 59. On this special occasion. I am sending this bouquet to wish you a very happy anniversary. You have always had me back. Both in good as well as bad times. So I am here to celebrate with you on this special day. 60. Sending you warm wishes on your anniversary; may you continue to grow older and happier together. 61. From best buddies, you turned to the spouse, And made a home out of a house!!! Happy wedding anniversary!!! 62. No words can describe my wishes for you two, Which comes from the heart that’s true!!! Happy wedding anniversary!! 64. Now is the time to celebrate, The love in your hearts today, For another year so quickly passed, Since your last anniversary day, May you share your love together. 66. You are happily living in a marriage for so many years and it’s a true joy to see you celebrating this special occasion for so many times. Wishing you to keep celebrating your love and your happy marriage, happy anniversary! 67. Nothing in this world could be as wonderful as the love you’ve given me. Your lοve makes my days sο very bright, just knοwing you are mine with me. Happy Anniversary. 68. I want to send you a very big anniversary card and gift for your 15th anniversary of successful marriage. This is once in a lifetime experience. Happy Anniversary. 71. Parties, dinners, and get-togethers – we have many selfish reasons to gather and wish you both a great life ahead. Happy anniversary. 72. I am the Tea Bag and you are my hot cup of water. Being drenched in your brings out the best in me. Happy anniversary..!!! 75. Relying, counting on each other, loving and caring that is what makes marriage so nice and strong! And you reached it. Best wishes and happy anniversary! 76. I wish to the most beautiful couple in all the land, May yοur anniversary be happy and memorable. Happy anniversary. 77. Wishing that you two will grow even closer together with each passing day. Happy anniversary. 78. On this special day, hοld your hands and take a sacred vοw, Τhat you will always Βe there for each other just like yοu have been till now! Happy Marriage anniversary! 80. You fall in love with each other, every time, May the milestones of your relation you climb!!! Happy wedding anniversary!!! 81. The bond of a marriage can take various forms, depending on whether life is imitating calm or storms. Sometimes in can be a beautiful knot, sometimes it can be a fragile cord. Regardless of what it is, I hope your lives overflow with bliss. Happy anniversary. 82. I Love you for what you are but I love you more for how you make me feel when I am with you. Happy anniversary. 83. My life revolves around yours to the extent that your smile brings sunrise, tears bring thunderstorms and laughter brings rainbows. Happy anniversary. 85. You know how much I love you? 86. Married life agrees with you, and i wish the best for both οf you! Thanks fοr being Μy friends! Happy Marriage anniversary! 87. I’m so glad that we’re together, I can’t imagine my life without you by my side. Wishing you endless joy on our anniversary. 88. May your love for each other grow and grow, And how strong is your relation, to the world you may show!!!! Happy wedding anniversary!!! 89. The echo of your love and the sound of the sea have a few things in common – they are both constant, soulful and eternal. Happy anniversary. 91. Our marriage may have been a bumpy ride with many speed breakers, but that is what has made us circumvent those obstacles and fly high in the sky. Happy anniversary. 94. Wishing you another wonderful year of marriage bliss together. Happy wedding anniversary. 95. May your marriage bloom like a flower every year, May there be only laughter and no tear!!!! Happy wedding anniversary!!! 96. Whatever you do and wherever life takes you, never underestimate the power of honesty, love, and friendship. Happy anniversary. 97. I can’t imagine myself with anyone else. 98. Even from the start, I knew you were the perfect one for me. Wishing us a very wonderful happy anniversary. 99. Your marriage is the most wonderful, Nothing than this can be more beautiful!!!! Happy wedding anniversary!!! 100. May the melody of your anniversary be played by Xylophone, But still, it won’t be sweeter than, for each other is your tone!!!! Happy wedding anniversary!!! 101. For some people, a perfect marriage is a myth, fairytale, legend, fable or false hope. But for me, it is a real thing which exists between you both. Happy anniversary. 102. A Beautiful rose for a Beautiful woman who is my Beautiful wife and has given me a Beautiful life. Happy anniversary. 103. I love you for what you are but I love you more for how you make me feel when I am with you. Happy anniversary. 104. I fell for you, you caught me.